This week on the Western Audio Visual blog, we will be discussing the Audio Visual technology that can be utilized in a conference room to enhance the usability of the room. 1.) Display System – When choosing a display system for your conference room, it is very important to choose a system that accomplishes all of the current and future goals that you may have for your conference room. The decision will be based mainly on the size of the room and what the room will be used for i.e. presentations, video conferencing, etc. The second option is a short throw interactive projector. These are utilized more commonly in larger conference rooms, as the display size will typically be larger than that of a TV. 2.) Video and Audio Conferencing – One of the main uses for a conference room is either Video or Audio Conferencing. In order to accomplish this, a Conferencing system that will accomplish your goals is required. There is a wide range of equipment that can be utilized, based on your needs. The 2 types of systems that can be utilized. The first is one with a “Hard Codec”, such as Polycom or Cisco. These systems are equipment based, and require the installation of the pieces of equipment necessary to enable the conferencing calls. The second is a system with a “Soft Codec”. These systems are software based and require a PC to operate. Skype for Business and Zoom are 2 examples of a conferencing system that utilizes a Soft Codec. 3.) Connectivity – The ability for an external source, such as a laptop, to connect a system are incredibly important. This can be accomplished through one of two ways. The first is a hard connection, such as through an HDMI or VGA cable. This will require a connection plate with an HDMI or VGA input to be installed in the conference table, wall, or some other location in the room. The external device will then plug in to the system and be able to show its screen on the display system. This plate will connect to the Control System, which we will discuss later. The second is a soft connection through wireless connectivity. This can be accomplished through one of two ways. The first way is through a system that requires the device to be on the same network as the AV System. An example of this would be Crestron’s Air Media technology. The second way is through a wireless device that plugs in to the external laptop through a USB device aka “Dongle”. These types of systems are good for someone, such as a vendor, to be able to wirelessly display on the AV system. With Network Security becoming an increasing concern, a system such as this is good for keeping unwanted people off of the network while still allowing for the external person to be able to present on the AV System. An example of this would be Barco’s ClickShare system. The Wireless Connection Device will also be connected to the Control System. 4.) Audio System – An Audio System with optimal sound projection is key. The days of using a TV’s speakers for the audio are long gone. An Audio System with ample coverage for the size of the room is definitely necessary. This will require speakers to cover the area, an amplifier to power said speakers, and the interface to control the volume. 5.) Control System – All of the technology we have discussed so far will require a Control System to utilize. The control system will have either a touch screen interface, connectivity to a device such as an Android Tablet or an iPad, or a web interface for the operation of the AV System. The control interface will be utilized to control everything in the room from volume control to source selection. The complexity of the control system utilized will depend upon the complexity of the other AV components in the room. Some examples of Control System Technology are Crestron and AMX. 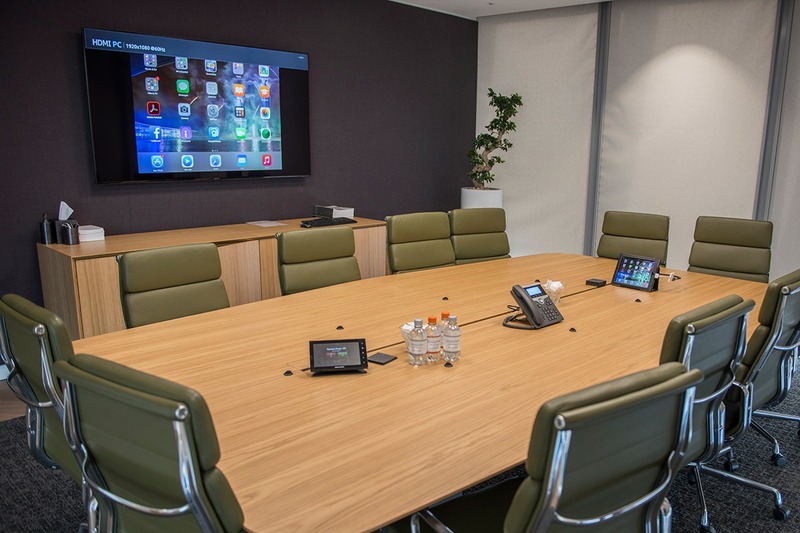 Are the Conference Rooms at your office in need of AV System upgrade? Please contact us to find out how we can help!